Make connections for researching, teaching and practicing digital scholarship at NC State. Digital humanities at NC State represents the grassroots efforts of its practitioners, including faculty, librarians, and students from across the university interested in computational research and digital media. Our community has thrived on innovative interdisciplinary partnerships, resulting in a set of faculty projects and university initiatives including a graduate certificate in DH (launched 2015) and a research cluster in Visual Narrative. The DH community at NC State also overlaps with other regular interest groups, including the NCSU Makes community, the Virtual Reality Interest Group (VRIG), the Data Science Initiative, the Digital Games Research Center, and more. NC State also collaborates with similar initiatives at UNC, Duke, and the National Humanities Center, all part of a regionally distinctive suite of research practices and learning opportunities in North Carolina’s Research Triangle. NC State and NCSU Libraries offer an array of world-class facilities for digital scholarship and research. Just a few are profiled here. CRDM Circuit Studio: an interdisciplinary, collaborative research space for faculty and students to explore, share and prototype projects. DH Hill Makerspace: a hands-on and staff-supported space for fabricating projects across a range of mediums and materials. See the map below for additional maker facilities around campus. NCSU Libraries visualization spaces: the world-renowned Hunt Library includes the Game Lab, Teaching and Visualization Lab and the Creativity Studio, while DH Hill Library features the immersive Visualization Studio. Games and Visual Narrative Suite: a space shared between the Visual Narrative cluster and the CS games research lab including collaborative working areas, projection facilities and seminar space. Faculty and students can get support for their research and teaching initiatives by consulting with CHASS IT and staff at the NCSU Libraries. Part of the Chancellor’s Faculty of Excellence Program, the Visual Narrative Initiative has four faculty hires at its core, spanning History, Art + Design, Computer Science and Electrical and Computer Engineering. The cluster pursues interdisciplinary collaborative research at the intersections of visual sense-making, design and computation. With shared events, courses available through the consortium, library initiatives and varied research teams, there are numerous opportunities to engage with DH communities in the Triangle. Carolina Digital Humanities Initiative: an outgrowth of UNC’s Digital Innovation Lab, the CDHI offers opportunities for digital research and training at graduate, postdoctoral and faculty levels. Wired! Lab: at the nexus of digital and visual scholarship at Duke University, the Wired Lab explores research in digital art history and cultural heritage. PhD Lab in Digital Knowledge: a collaborative experience of “digital knowledge” among doctoral students in the region, the PhD Lab hosts events and workshops throughout the year. CHAT Festival: The Collaborations in Humanities, Arts, Technology Festival (CHAT) is a bi-annual gathering of scholars, students and digital media arts practitioners in the region. It is alternately hosted around the Triangle. 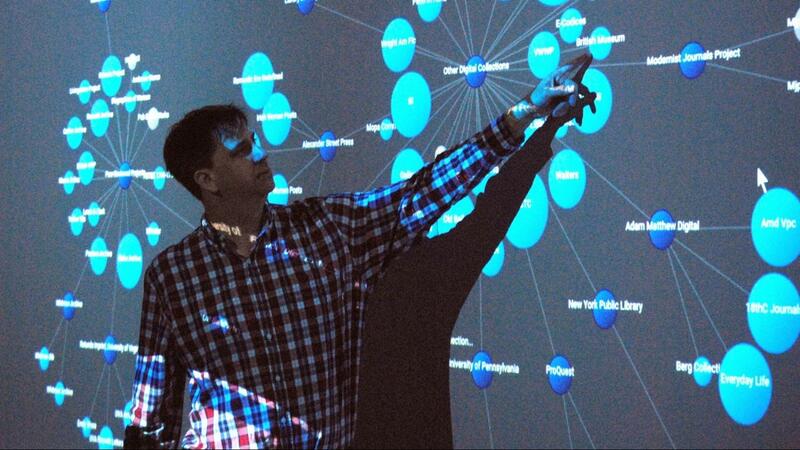 Many of these initiatives are coordinated among the Triangle Digital Humanities Network, a collaboration among NC State, UNC, Duke and the National Humanities Center. The group supports an array of shared events and resources in the region. Its core initiatives include: graduate training opportunities across institutions in the Triangle, including DH certificates and shared courses; guest speakers, seminars, and conferences in the region, from library workshops to THATCamps and the biannual CHAT Festival; and helping to connect researchers in the region as a clearinghouse for projects, contacts and scholarly opportunities.